Folks, it's been a rollercoaster of a day--mostly headed UP UP AND AWAYYYYY! I got way too little sleep, but got Caitlin to the bus on time. I got Arthur rounded up and headed in to TSC for some chick feed (because they might get here TOMORROW!! YAYYYY!). While there, I congratulated myself on not buying the 5 or so Silkies (and yes, this time I'm SURE that they were Silkies) that were in the Miscellaneous Bantam tank. See, I'm getting better. I don't have to buy every Silkie I see. I still WANT to, but hey. We dashed home and got Arthur some lunch before heading off to the Marion Pride Committee meeting. I had pate for lunch. Trust me, chicken liver pate can be delicious. The kids beg for it. Anyway, long story short, I got nominated and seconded to be chairman of our local farmers' market this year. I feel like a deer in front of a Peterbilt. People, the closest I've come to this was running my lemonade stand for one afternoon about 30 years ago. Oh well, I DO have some ideas that I think will work well for everyone. Apparently I have a latent marketing gene that's coming to the surface. So, talking to my mom today (as I usually do), we discussed what I'm going to sell at the market. Folks, I'm diversified all over the place. Umpteen kinds of produce, eggs, feed bags made into tote bags, firelighters (for the campers I hope to pull in from the lakes) and maybe even bait worms once we get ours started. The laughing memories ensued. It probably didn't help that I'm in the mood to go walleye fishing. You see, I was raised Mennonite, but I went with my mom to the Pentecostal church she liked for a while. On the way there, every Sunday, we passed a machine. A very unique machine. I'm rather sorry we never stopped to get a closer look. It was called "Vend-A-Bait." Now stop and think about that. 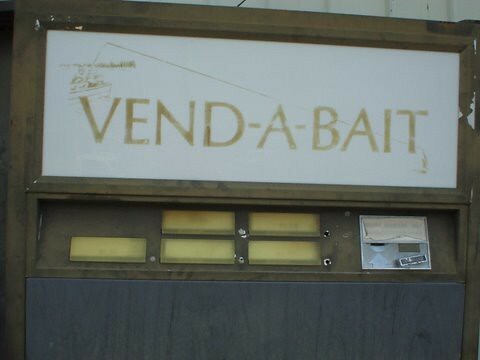 Vend-A-Bait? How do you sell bait from a machine? Are the minnows trained to swim up a pipe and into the cup when they hear quarters? (and if so, how do you get them to stop?) Is there a little kid in there earning his allowance reading the buttons and counting out your worms? Can worms be bruised and traumatized by tumbling down the chute, thereby minimizing their fishing effectiveness? Exactly how much stink bait can you get for a dollar? Do people really use it as "Texas Sushi" (pick up the goldfish and swallow it)? If there were minnows or goldfish in there, how did they get fed? The prevailing image in my young mind though, was that the only way this could work was that there was a giant tapeworm in there rolled up on a stick (kind of like toilet paper). Each quarter got you a segment. Hey, give me a break. I knew that tapeworms had segments, but apparently I wasn't smart enough to know that you can't use them for bait. Are you done laughing yet? Dang, I keep having to wait for you to wind down. You're giving me a complex here. You didn't believe me, did you? Here are some pics. and here's the more modern updated version. Scott looks at me funny (how come he does that so often lately?!?) when I tell him I want to own one of the old Vend-A-Bait machines. Heck, maybe I could use it to raise some of those fancy Canadian nightcrawlers. We could get people from all over the county since the local bait shop went out of business. I even have kids I could stick in there to count out worms. They like counting worms. It MIGHT keep them out of trouble. MIGHT. NOT. At least I'm not going to stock a tapeworm on a stick. I should probably start training those minnows though.